are believed to have found their way to the northern mountain ranges through the land bridges. But by the time the Spanish explorer Ferdinand Magellan discovered the archipelago by accident, having taken an uncharted route in his search for spices, the Filipinos have had established a culture made up of kingships ruled by datus. Down south however, the islands that used to be part of the Madjapahit Empire, which was a powerful sultanate, stood apart with their predominantly Muslim culture. , known to be older than Harvard, founded by the Dominicans and one of the earliest colleges run by the Jesuits exist to this day. Only two of the churches—one, being the Manila Cathedral and the other, the San Agustin Church and Convent of the Agustinians—have survived earthquakes, fires and bombings during World War II.
. As with most colonial rule, the Spanish government was known to be oppressive. Life for native Filipinos remained economically stagnant except for those favored by the Spaniards. An elite class called the principalia that owned most of the farms, which were awarded by local Spanish officials, emerged. From most of these families, were born the landlords who owned large tracts of lands until the 1970s and for whom all of the townspeople, sometimes, served as chattels. This privileged class remains for the most part the ruling elite, most of them having converted landholdings into corporations. ’ national hero executed at the Luneta, a Spanish promenade along the walls facing the bay, was one of them. The church and state were not separate under Spanish rule. Towns were founded simultaneously as a ‘visita’ and a municipality. 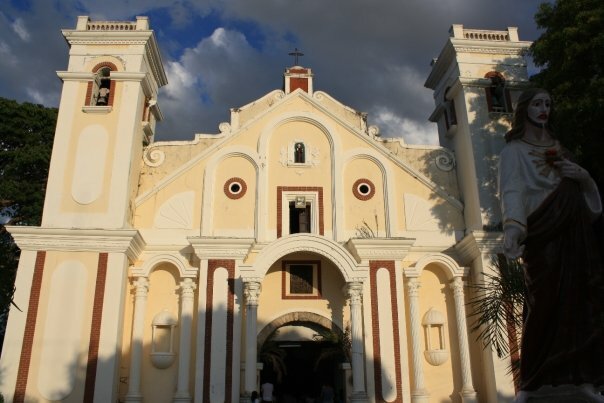 A ‘visita’ identifies the town first as a parish so much so that the axis of all Philippine towns is the church, a plaza and the municipal hall. The Agustinian and Dominican missionaries did most of the conversion and the town planning, using catechism to teach reading and church rituals to evangelize. Most of those brick churches were built—where they stand to this day—on grounds sacred to the natives. Labor for those churches was extracted from the natives though in Intramuros, the Spaniards hired the Chinese who sailed in. The missionaries also converted native rituals of harvesting, fishing, and honoring the dead into religious feasts. Depending on the livelihood of the towns, the Spaniards chose a patron saint to be honored during these feasts. The natives were then encouraged to offer their produce to God through the intercession of such a saint. The feasts, called fiesta, were spectacles of religious processions, and community dancing and singing. Families gathered with especial dishes; their homes were decked with their produce made into craft objects. Such feasts are celebrated to this day. , however, the Muslims, then identified as Moros, put up a strong resistance that lasted for thirteen years when American troops partly defeated them. government introduced a series of reforms including efficient systems to deliver health services and prevent illnesses. More than inroads to health, they reformed public instruction,building a network of schools in all towns, and state universities. In consonance with their role to train the Filipinos for democracy, they also instituted English as the medium of instruction. Among the most significant reforms in government rule the Americans initiated was the separation of the church and state. A number of religious landholdings were taken over and distributed to tenants. It was also during this regime when a schism led by nationalists in the clergy happened in the Catholic Church; they founded and established the Philippine Independent Church or Aglipayan church named after their leader. With the coming of the Americans, Protestant churches started to abound. , shortly after World War II, a fierce war the Filipinos fought alongside the Americans against the Japanese. But rehabilitation was never complete—to this day, the government is still learning how to make independence and democracy work. The country has been plagued by economic stagnation and widespread poverty, thus, also of insurgency such as that of the Communist-led parties as well as the Muslim ‘separation-ist’ movement, and too, frequent protests in the countryside and the cities all aimed at overthrowing the government. in terms of industrial growth. But in truth, the masses grew more poverty-stricken and the gap between the rich and poor widened. In 1986, Marcos was overthrown in a most unique revolution led by oppositionists and the Catholic Church. Known as a ‘peaceful revolution’, it was waged with prayer vigils. A return to civilian rule, however, has not succeeded in an improved economy that must ideally seep down to the masses. To this day, the government is plagued by political unrest, a weak economy, and widespread poverty. Yet, Filipinos, as it is their nature, have demonstrated a most uncanny flexibility and a fierce spirit of survival. Most of all, as evidenced by religious gatherings, they continue to witness their faith in God’s providence—migration for one, for which they pray, petition and if granted, consider it not only as a blessing but a miracle.